When the third-generation Corvette came out in the late ‘60s, it was a huge departure for the kind of car that it was, a major design departure. When it came time to replace that car all the way in the early ‘80s, there was a huge question about how radical that new design would be. And that meant that there were all kinds of weird alternate proposals that never made it. The story of the C4 Corvette, as it debuted in the early 1980s, was a bit of a weird one. The issue I have of Car Styling that goes over its whole design development starts with the Wankel-engine Four Rotor concept of the early ‘70s. Apparently GM was reasonably seriously considering going mid-engine for the Vette. That was still the plan even after the ‘73 Oil Crisis, with just a V8 in place of a gas-swilling rotary. Why that never came to be Car Styling doesn’t say, but it does note that GM made its official front-engine decision in 1978, and shows the orange and black two-tone car with slot mags along with it. If you had a front-engine Ferrari Berlinetta Boxer, it would look like this. Kinda. The next proposals got much closer to the C4 as we got it, the first of which came in late ‘79 and looks like a Trans Am. it’s the white and red one. It got the front end right, but kinda flubbed the side and the back. You can see there’s a clearer view of how the car was going to come together by 1980, though you can see it had venetian blinds over the rear lights. Another rear light design you can see above in red, which is, uh, unfortunate. Also note that there’s no power bulge on the hood. Also if you look over to the right side of the page, you can see that the C4's dash could have been even more digital. Look at all of those colored readouts. I am fairly sure one of those buttons alerts you if there is a nearby Soviet submarine. The button next to it is for one ping only. Wait, wrong decade? Nevermind. You can see the production version in blue below it, which, really, is not all that different after all. 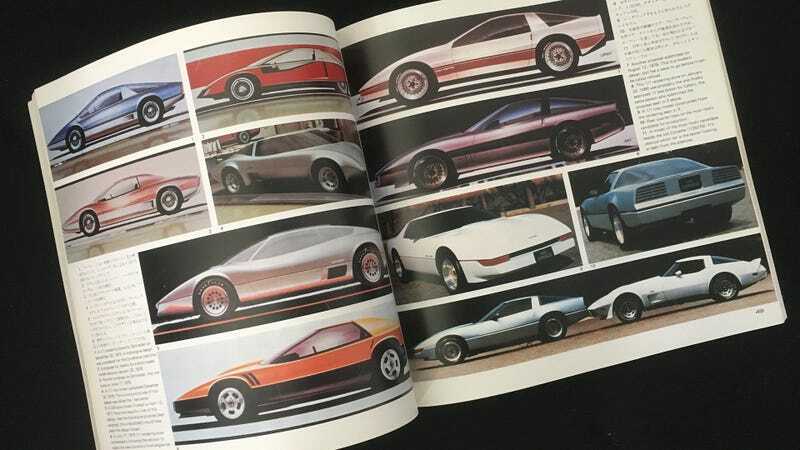 As it is, it’s interesting that the Corvette, in going for a fairly pure-aero wedge design ended up without too much variation on how different it could look once that layout was decided. But it’s the little details that really throw the whole thing off. And honestly, as a design, the C4 is not an ugly car. If it’d had better ride, comfort and build quality than, say a Cozy Coupe, it might have put itself on the road to being a future classic. But that would have been a big if for ’80s GM. Would You Daily Drive A C4 Corvette Now That They&apos;re Dirt Cheap?